First major installation by TSP-NORWAY ! The new solifluction station installed and starting to record data 3 July. Photo Hanne H. Christiansen. Last week, during the UNIS course AG-327 ‘Holocene and recent climate changes in the high arctic Svalbard landscape’, we installed a solifluction station on a large solifluction sheet at the eastern limit of the strandflat of western Svalbard , at the western foot of the Griegaksla mountains. 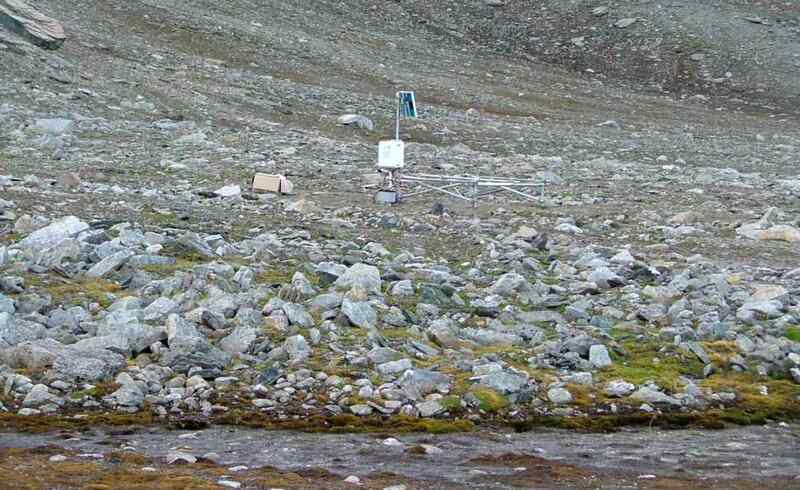 The installations include a shallow borehole, in which the top permafrost temperature is being measured on an hourly basis from the surface to 2 m depth. This is the first major installation done as part of the Nordenskiöldland Permafrost Observatory in Svalbard. The station will record data during the rest of the IPY, and hopefully for many years after as well. Lene Kristensen did geophysical surveying as part of the basis for choosing the best site for the solifluction station. Several of the UNIS students tried drilling into permafrost for the first time, as part of this installation (see below). We used a rotating hand-held drill, which enables us to reach depths of 2-3 m below the terrain surface. At the installation site we reached the permafrost top around 150 cm, but the ground was frozen from 80 cm and down, as the installation was carried out in the the early summer. The frame carrying the station is anchored into the permafrost with four legs. The lower part of the still frozen active layer was relatively dry, and without visible ice, but the topmost part of the permafrost was ice-rich, at least 50% by volume. UNIS student Stephan Vogel (right) and Dr. Fraser Smith (left) from Dundee university drilling into permafrost, to anchor the solifluction station. To the right part of the ice-rich top of permafrost is seen. Scale below (cm) indicate depth below ground surface. Photos Hanne H. Christiansen and Ole Humlum. Installing the solifluction station involves lots of sawing, drilling, measuring, digging and other practical work. Photos: Fraser Smith and Ole Humlum. Foot plate registering soil movements. Photo Ole Humlum. 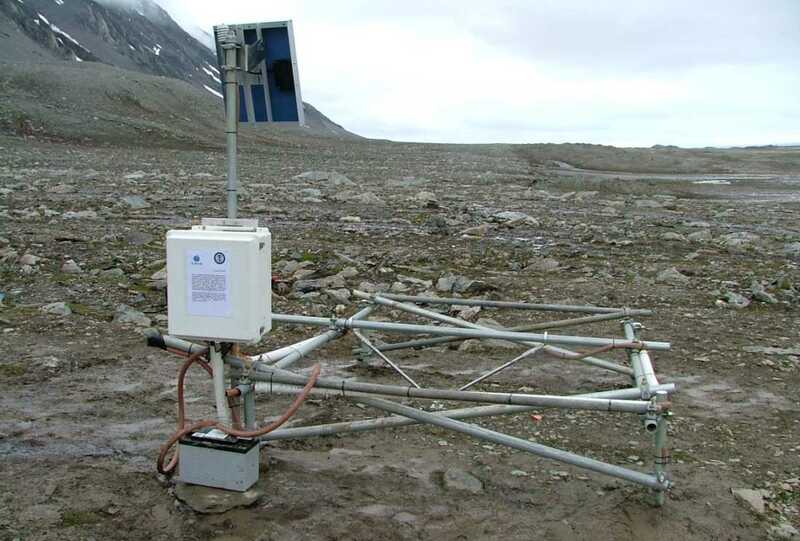 A plate standing on the ground surface (see above) is monitoring movements on hourly basis, so that we can record hourly winter frost heave and downslope movement during summer thaw. During the autumn freezing of the ground, ice lenses forming in the ground lifts the surface. When all water in the ground above the permafrost is frozen in winter then surface will be stable till spring thaw starts, and the ground surface then settles in downslope direction. This process is causing the top soil to creep downslope with an estimated speed of about 2-4 cm annualy. The solifluction station will provide data for a detailed analysis of all movement components and associated meteorological parameters. The station is also equipped to measure ground temperatures in 10 depths from the terrain surface down to 2 m, and snow temperatures at 10 cm and 25 cm altitude above the ground surface. Also air temperature at 2 m above ground is measured. In the ground we register the pore water pressure at 4 depths to be able to calculate when flow at different depths will be possible. The permafrost temperature recorded at 2 m depth during the first day of measurements was -1.6°C, and is expected to sink somewhat for a period following the drilling process. The preparations and installation of the station lasted 10 days, of which we spent 6 days doing the field installation. Unfortunately, the weather was rather cold and windy, with rain and snow during most of the field time. The solifluction station standing on the solifluction sheet at Griegaksla. Photo Hanne H. Christiansen.